Recall to Weavers; The Blackburn Poachers; Tackler Joe Proposes; It’s Nobbut Me; What Could Aw Say; Friends are Few when Fooak are Poor; A Lift Upon the Way; Coal Pit Lane; Accrington Pals; Pendle Sally; My Garden (Posey Joe); Shuttle-Kissin’; Manchester Song (Rich Man - Poor Man); A Song of Windmill Land; Scatter Your Crumbs; Love; The Coaler; My Piece is o’ bu’ Woven Eawt (A Weaver’s Prayer). Harry Langston has pitched this album as a personal view of Lancashire, presented as it is with details not only of the background to the songs but a comprehensive memoire of his own upbringing, his early life in Burnley, early employment, student life in York, encountering the folk revival, and then moving around the country until settling in Bristol. As such it paints the conventional picture of a Burnley sixty years ago, where terraced communities lived 'cheek by jowl', everyone 'mucked in' together, family gatherings were common with singsongs round the fire and where views always included the mill or the pit, and were obscured and sullied by soot and smoke before the Clean Air Act. All this serves to show how Harry has never lost the feeling of his Lancashire roots, and the tracks on the album are a culmination of songs and poems he has revived to keep that memory alive. As to his choice of material, it's refreshing to see an album which respects and celebrates the dustier corners of the Lancashire literary repertoire, instead of producing a 'Lanky' album extolling the virtues of Rawtenstall's annual fair and telling of the 'old chap, down our street in his cosy cottage greenhouse' - again. Indeed, a music hall approach to the songs, so much a part of the perceived Lancashire repertoire, particularly in the 20th century, is not much in evidence. While this doesn't bother us, students of Lancashire song may feel this is needed to achieve an overall balance of the form. However resurgence of interest in the material of the local poets and writers has concentrated more on the historical aspects of the form rather than the 'entertainment' factor. In this case, the approach and sound of this album is very much in the folk tradition, with many unaccompanied tracks and an instrumentation of fiddle, dulcimer (as opposed to guitar), mouth-organ, cello and a solid 'come all ye' style chorus. Concertina also features on some tracks. To some extent, this approach is similar to early revivalists like Harry Boardman who sang an equally unclichéd repertoire with fiddle, banjo, guitar and concertina along with unaccompanied songs, but it is interesting to note that Harry (Langston) does not acknowledge any Lancashire singers like Boardman among his influences and we feel this adds to our view of his personal approach to the songs. Whilst widely read in Lancashire material which is obvious through his choice of songs on this album, it would have been interesting to know what the catalyst was for his in-depth appreciation other than his acknowledgement of the Watersons, McPeakes, etc, as influences. Many of the songs are delivered in a reflective way that gives time for the listener to consider the words fully. 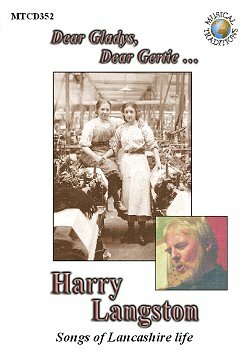 Harry has generally chosen material from a variety of Lancashire poets, well-known names to students of the form but we're sure little known to anyone else. Edwin Waugh is perhaps the most celebrated, but contributions from the Blackburn 'Poets Corner' of Baron, Billington and Whalley, and other notables such as 'Teddy Ashton', Cronshaw, Fitton, Bealey and Brierley present a variety of poetic style which is most welcome. Indeed Ashton's poem in praise of the Fylde is for us a winner, in terms of poetry and performance. Apart from two self penned songs, and a traditional song, Blackburn Poachers, the other writers include Mary Thomason, John Holt, Walter Emsley, and Elizabeth Gaskell - the author of Mary Barton. We were pleased to hear the work of the first three poets, being unfamiliar with them at first glance, but we knew the Gaskell reference, having presented an appreciation of her work at Manchester's John Rylands' Library last year as part of the bi-centennial celebration of her birth. In fact, it seems the Manchester Song was actually a poem written by her husband William Gaskell, who was the minister at the Unitarian chapel in the city. The performances of the songs from the poems are clear and simple in arrangement ensuring the words are always intelligible. As most songs are unaccompanied this is self-evident but even when accompanied there is no clutter or pointless instrumentation. We'd have liked to have heard more concertina, as there's lots of pictures of Harry playing it in the booklet, and, as it features on the Windmill Land song which we enjoyed the most. In Waugh's A Lift on the Way Harry acknowledges that although he wrote his own tune, he later discovered a tune by Jackson but says he stuck to his own because people liked hearing it. Many late 19th century composers wrote music to Waugh's poetry, most notably C E Rowley and Jackson, and to our mind were more attuned to the sentiments of the time. In this case it was said that A Lift on the Way contained 'a sermon in each verse' and both Jackson and Rowley produce a more measured, solemn, yet uplifting tune to suit. Mind you, Waugh's own choice was Come, Sit Down my Cronies, from a poem by Scotsman Walter Watson, the Chryston poet, the most likely tune being Sae Will We Yet which from modern versions it seems is the same tune as The Wearing of the Green. Certainly that tune fits very well to the words and we'd like to hear a version using that as its source. Harry emphasises his own take on the poetry by composing new melodies to all the tracks. Of course, as poems they would have no tune by definition so this is self evident, but Harry has also used his own tune on, for instance A Lift on the Way, for which, as discussed above, there are certain variations. They sit very well with the style of tunes that have been put to similar songs over the years - certainly since the revival in the 1960s - and as such they are easy on the ear and assist with anyone wanting to learn any of the songs. Harry has written just two of the songs on the album, the title track, and one about the Pals, an aspect of World War One remembered in memorials in Lancashire cotton towns like Chorley, which is well explained in the notes. We find the tune far too jaunty for such a deeply felt topic where whole communities lost a great number of their menfolk. Even if they marched off in high spirits we'd have been tempted to add gravitas through a slower tempo when the 'living hell' emerges in verse three. Perhaps the chorus was meant to be reflective of the marching off to war, but the arrangement seems to clash with the imagery of the later verses. The album is lavishly packaged by Musical Traditions Records, containing a CD and a 24-page book, with full lyrics in DVD style case. Because of this, we fear purchasers may expect a DVD when they buy it and will be disappointed. I think a note on the cover to say it is a CD would help, though in this world of 'carbon footprints' a 'mixed mode' or 'CD Extra' would help the rainforests, by using a CD containing the audio and a PDF of the booklet, particularly as the text, etc. is already digitally archived for use on the Mustrad website. The booklet and the DVD style could then be dispensed with. All in all, an interesting journey into the lesser-known areas of the Lancashire literary tradition, sympathetically presented by Harry, his band and chorus, and recommended for all those with an interest in the County Palatine.